My sourdough starter is starting to make me feel bad. 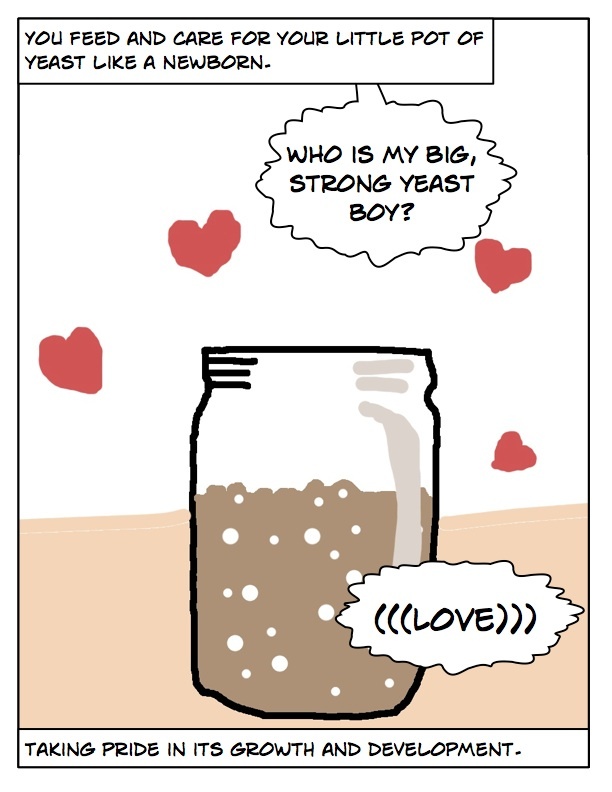 I've been taking such good care of my little pot of yeast and I am so proud of it. Every day I take charge of feeding it, watering it, keeping it warm and it grows, bubbles and thrives under my care. This makes me feel quite aware that my Mr. Stinky is a living breathing thing. Now the anthropomorphized Mr. Stinky is making me feel really guilty about his care routine. I'm so sorry, Mr. Stinky! Hahaha, amazing. Makes me want a Mr. Stinky for my very own. Hahahahaha! Amazing cartoon, and very true. I am the worst sourdough mom. I got my starter from a bread-making class. After the class I went to the gym and accidentally brought my starter, which was in my gym bag, into the sauna with me. Just for a minute, but still! Then I forgot to feed it for several weeks. You know what? It came right back to life! It was a little grumpy, but with some extra TLC it was all bubbly and happy again. Crazy! 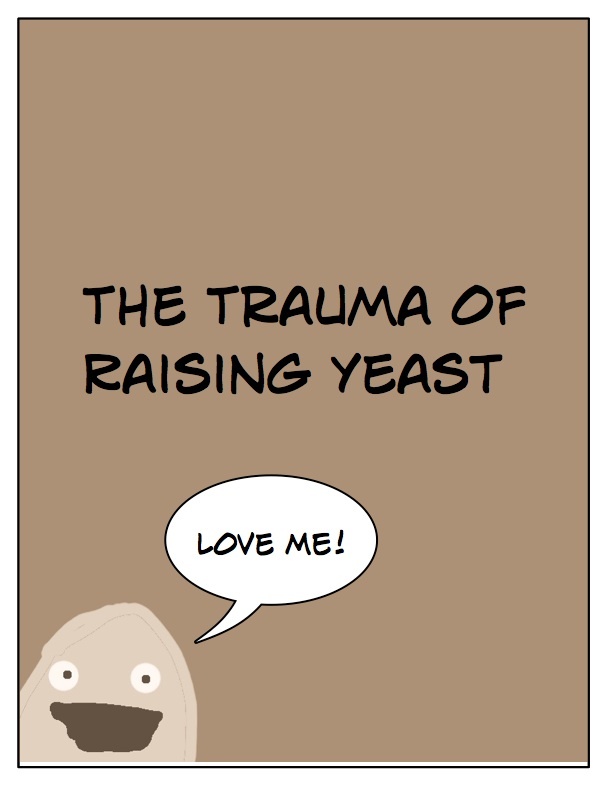 Woo, I'm not the only crazy person who baby-talks her yeast! Or maybe I'm deranged because I don't given a second thought to the little micro-organisms that sacrificed their lives for my yummy bread goodness? 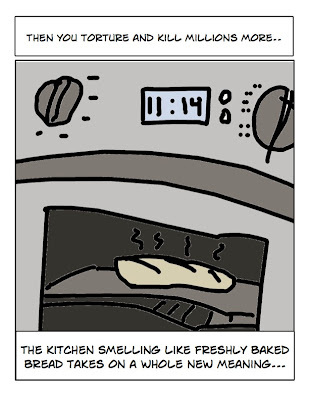 All is forgotten when fresh bread comes from the oven. LOL!!! Wow, the animation is FANTASTIC!! Cute story. I can barely draw a straight line using my laptop's touch pad. Thank goodness I'm not the only one who feels like I've got a live pet sitting on my counter! 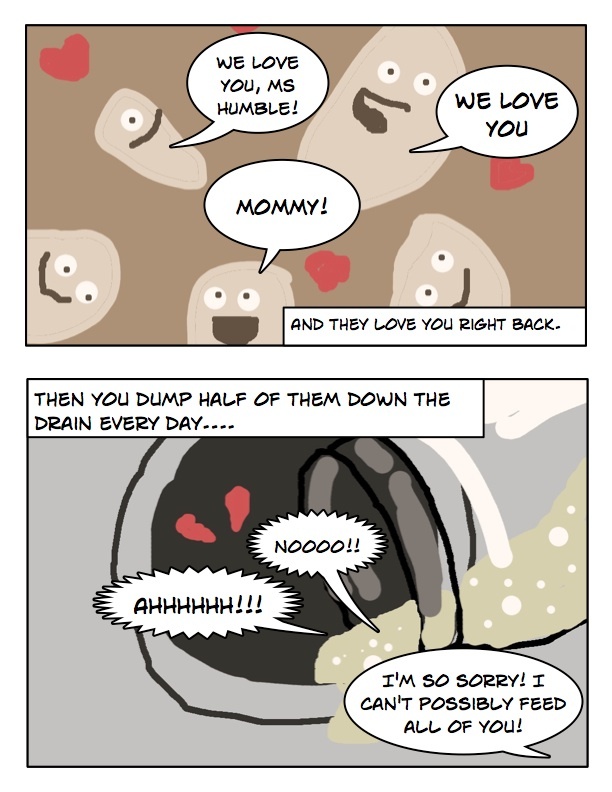 I feel guilty every time some goes down the drain... wonderful depiction! hahahaha love it! I'm personally into the NY Times no knead bread right now...super easy and tasty. That is the funniest thing I have seen all day! BRAVO!! Working for a multinational brewer, this comic sums up my relationship with yeast just on a much different scale. Ever since I learned that yeast were living organisms, I've always felt a bit odd about using it--and killing it. At least you're not freeze-drying the little beasties, cramming them into vacuum-packed envelopes and sending them off to total strangers in exchange for money, to be abused under unknown circumstances, like microbial chattel. Like pasture-raised meat, they're living the good life up until The Moment. My baked goods calling me a murderer? No, not recently. They usually know better than that. 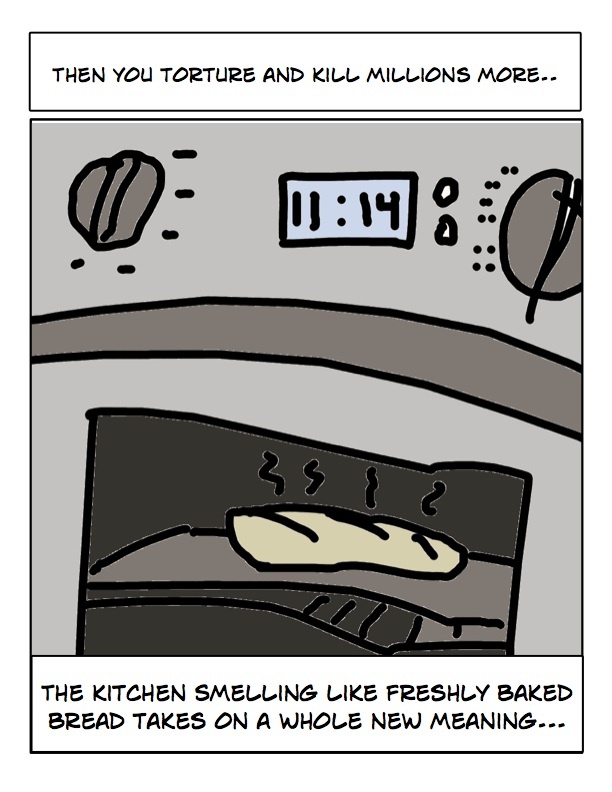 MMMMMM baked bread. Just started making French bread OH! Just wonderful, I can not go back to store bought bread. Enjoy your blog immensely! You do know that you don't need to feed it every day, right? As long as you keep it in the fridge, it can go 6-8 weeks without being fed. As long as you're baking with it more often than that, there's no reason to feed and dump it. 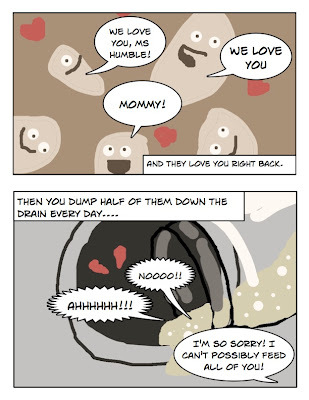 You still have to kill the yeast babies to bake, but at least you aren't dumping them down the drain. I can second Mad Gastronomer's statement. I feed my starter once a week, and keep it in the fridge. I get it out to proof the night before I want to use it...requires some planning, but much less work! We maintain ours at room temperature simply because we use it 4-5 times a week and need it to grow and refresh itself. Mr. Humble has been churning out the baked goods almost daily. His latest obsession: Sourdough Pancakes. I'm making sourdough pancakes later this week, as my girlfriend is staying over (while I'm working graveyard, alas, but I get to feed her breakfast when I get home). Sooooooo tasty! I've got instructions (not really a recipe) for sourdough crumpets around here somewhere, if you're interested. 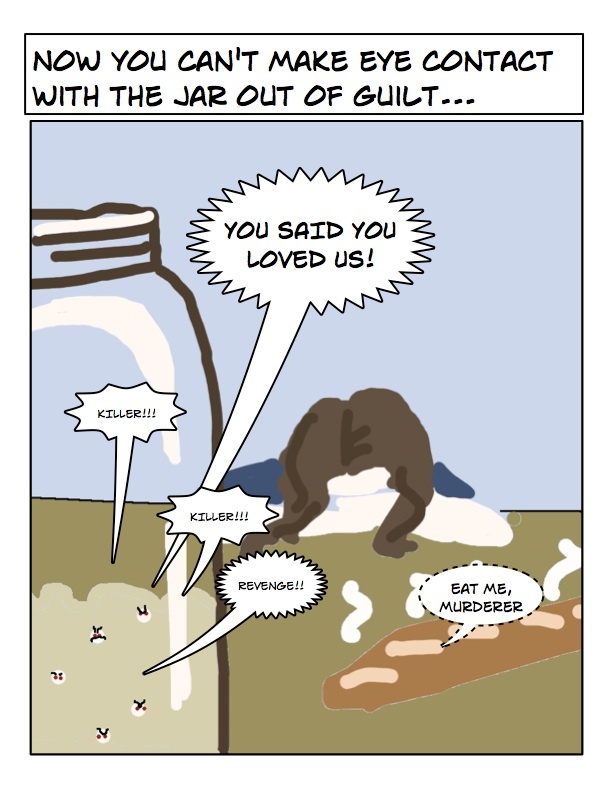 You've brought this blog to a whole new level with this webcomic. Excellent! Anyway, Faulkner told us we must kill our darlings. Don't feel too bad, they reproduce quickly. I'll never look at sour dough bread the same way. Regardless, I can't wait to get started! Like the sort done at www.thekitchn.com? We called our starter Jesus. Because he always rose again. I haven't gotten nearly so attached to my starter, but it's probably because I'm not allowed to keep it on the counter so I don't get the same joy of visiting it every time I enter the kitchen. You know they were going to happen eventually. I am sharing your post with friends!